Hardened steel staple resists cutting, sawing, and hammering. Zinc plated hardened steel for added strength and weatherability. 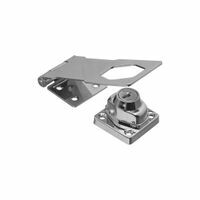 Mounting hardware included for installation. Applications: trailers, van doors, garages, sheds, barns, storage buildings, vending machines, utility rooms, and warehouse doors. 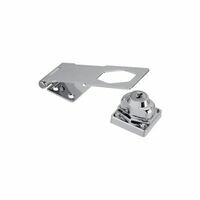 Accepts shackle diameter up to 7/16".